Floral Hopping Good Time White by Me and My Sister Designs. Simple drawings of bunnies with colorful tails on white background. Sold by the yard. Chambray Rose by Nancy Gere. Small-scale white flowers and vines with pops of light blue and purple on blue background. Sold by the yard. Adele by Whistler Studios. Shades of blue and white berries and leaves on navy background. Sold by the yard. Adele by Whistler Studios. Shades of blue large-scale flowers with smaller leaves and berries on white background. Sold by the yard. Notepad by Another Point of View. Minuscule white hearts on light blue background. Sold by the yard. Adele by Whistler Studios. Shades of blue berries and leaves on white background. Sold by the yard. Adele by Whistler Studios. Shades of blue and white berries and leaves on blue background. Sold by the yard. Charming by Gerri Robinson. 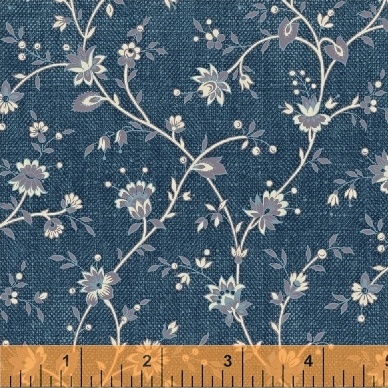 Shades of taupe flowers with gray leaves on blue background. Sold by the yard. Charming by Gerri Robinson. Blue background with small, rustic red diamonds and gray polka dots all over. Sold by the yard. Charming by Gerri Robinson. Small-scale, white flowers and leaves on navy background. Sold by the yard.